Getting beat by the New England Patriots is not good; losing two linebackers in the same game is yet another. 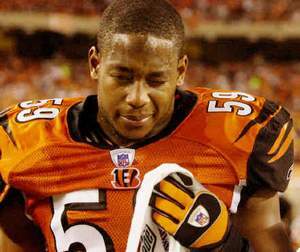 After the Cincinnati Bengals’ loss to the Patriots Monday night, the only remaining healthy LB’s on the team were Dhani Jones and Anthony Schlegel – both recently signed. To give you an idea on how bad the LB situation in Cincinnati is, let’s go back to the Patriots-Bengals game last night. On the first drive of the game for the Patriots, LB Lemar Marshall tore his left Achilles tendon, putting him out for the season. Second quarter – LB Landon Johnson left with an eye injury; Johnson said he had no idea what got into his helmet that caused the injury. As a result of these 2 mishaps, defensive end Robert Geathers was temporarily moved to the strong linebacker position, a position he had never plaued in either college or the NFL. The following weeks will be crucial for the Bengals as far as getting their linebackers back relatively healthy. As it stands right now, they have been without Rashad Jeanty (lower leg), Ahmad Brooks (groin) and Brooks’ backup, Caleb Miller (lower back) for extended periods of time. This perhaps could explain, to a degree, their defense getting exploited these past 4 weeks. But regardless, if you do not have a healthy linebacking corps, your pass defense and most definitely your run defense will get exploited. Johnson’s injury doesn’t appear to be long-term (although injury reports have not come out yet) and it appears that Geathers may again see some time at linebacker, unless some of the aforementioned LB’s are healthy enough to return.